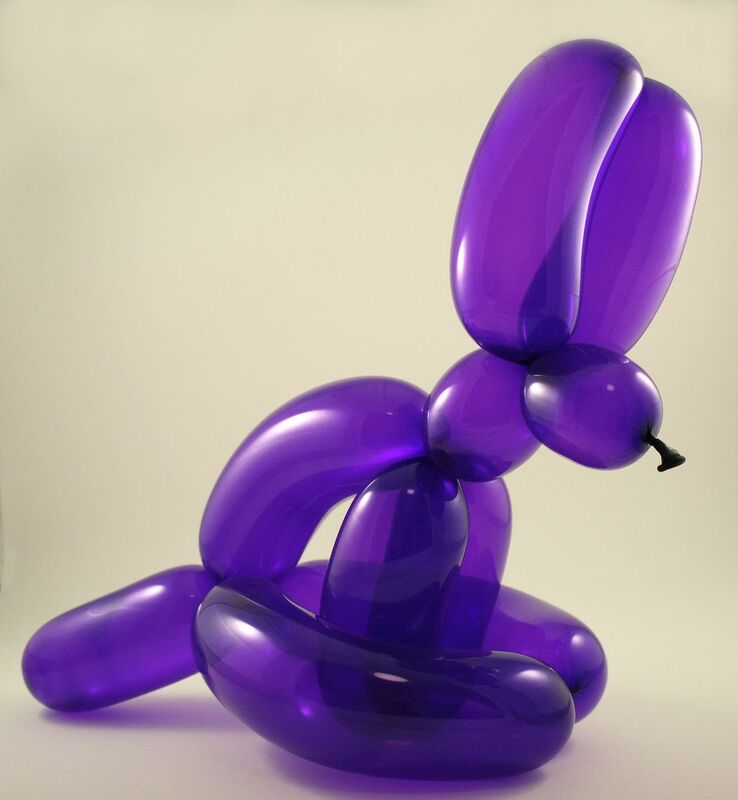 Here's a rabbit or bunny balloon animal that is actually a variation on a dog balloon. If you can already make a basic dog balloon, you can make a bunny. As with all balloon sculptures and animals, it's all in the proportions that you make. The rabbit is basically a dog with long ears and extended back legs. If you'd like to learn a more detailed rabbit balloon animal, check out our step-by-step instructions for balloon rabbit version 2. This is one of the cutest balloon animals that you can learn to make but it's rather complicated. We strongly suggest that you first learn to twist a basic dog balloon before you try to make the rabbit or bunny. You will need to know how to make basic and lock twists. Inflate the balloon to about three inches from the end. Twist one basic balloon twist, about an inch and half long, which will form the nose of the bunny. Twist two basic balloon twists. The second and third twists will be larger, about three inches each, to form the bunny's ears. Bring the first twist against the main body of the balloon in preparation for a lock twist. As mentioned on the last page, the first balloon segment will form the nose of the bunny. The second and third twists will form the bunny's ears. You'll be twisting the second and third twists together while holding the main body of the balloon to create a lock twist. Your balloon sculpture should now resemble the head of a bunny. Twist three basic balloon twists, the first about two inches, and the second and third about three inches each. The first twist will form the bunny’s neck. The second and third twists will form the front legs. As you did with the head, create a lock twist by twisting the second and third twists and holding the rest of the balloon. Your balloon animal should now resemble the front of a bunny with its head and front legs. Twist three basic balloon twists, the first about three inches and the second and third about three-inches. The first twist will form the bunny’s body. The second and third twists will form the bunny’s back legs. The final balloon segment will form the rabbit’s tail. The lengths we state above are strictly suggestions. Because you want a small tail for the bunny, in essence, a little ball, you’ll want to adjust the size of the legs so you have a small section of the balloon left for the tail. As you did with the rabbit's front legs create a lock twist by twisting segments B and C and holding the rest. Tuck the arms of the bunny into the legs to make a sitting bunny. You have now twisted a basic rabbit or bunny balloon animal. If you like, you can use a marker to add "eyes." Also, feel free to play and adjust the proportions. These instructions show you how to make a bunny who's seated in classic bunny fashion, but feel free to make a bunny in the proportions of a standard dog balloon. With balloons, you're free to experiment until you create the sculpture that you like.